Chile’s Torres del Paine ‘W’ Circuit is one of the best known walks in Chilean Patagonia. This walk takes you through some of Patagonia’s finest wilderness areas. The trail begins at Lago Grey and continues along the lake and up the Vallee Frances before continuing to the Chileno Valley and the Torres del Paine (Towers of Paine). Rudolf Abraham has written a Cicerone guidebook ‘Torres del Paine – Trekking in Chile’s Premier Park’, which is a useful illustrated book, with line-drawings, detailed maps and route directions. The Torres del Paine route is 58 km long and for those contemplating this trail for their walking holiday in Patagonia, some planning is required. The path is well marked, but the Patagonian weather is unpredictable and needs to be catered for. 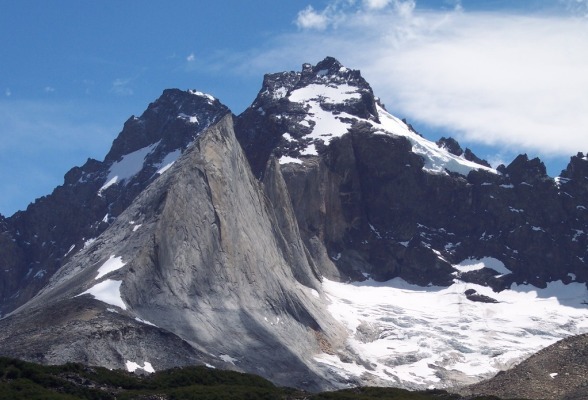 Some general information about the walk: Torres del Paine ‘W’ Circuit: Starting from Refugio Grey, the 58 km trail wends its way along a ‘W’ shaped route, ending up at the base of the Paine Towers. There are some ascents and descents along the way, but it’s generally an accessible walk. Some Highlights: Grey Glacier, the refugios, the Cuernos (mountains), Vallee Frances with its snow covered mountainsides, the Chileno Valley and the Torres del Paine. The number of days required depends on how fit and how quickly or leisurely you want your walking holiday to be. Work out the average number of kilometres you are prepared to do in a day, taking into account the landscape and the refugio in which you will end your day. We did the walk in 5 days. Luggage transfer: This service is available for guided walkers and can be organized through a number of tour operators on the ‘guided’ itineraries. Independent walkers need to carry their own gear. Your Torres del Paine Accommodation: This is in refugios and must be booked in advance. There is the option for camping as well. Bring your own tents. Food: Most walkers take advantage of the great meals provided by the refugios’ staff. Determined walkers can cook their own in the campsites. When to go? The northern Spring or Autumn seasons are recommended as accommodation is easier to obtain and the tourist numbers are lower. This is Chile’s premier Patagonian walk. The mountains, glaciers and lakes on this 58 km journey through Patagonia are inspiring, so remember to bring your camera. Be prepared for rain, wind and wonderful walking. The path is usually walked from Refugio Grey to Refugio Chileno.